I’m not even the slightest bit concerned about how heavy, how long, or how many fish I catch. 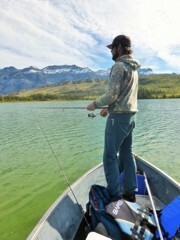 I do like to catch big fish and lots of them, but it simply isn’t necessary for a fishing trip to be great. The numbers do not matter and they haven’t mattered for some time. I expect this is part of the evolution of being a fisherman, and after you or I have caught so many fish, the real prize suddenly becomes clear: its the experience that counts. Experiences define a trip. The memories they create are what cause you to smile, and get excited. 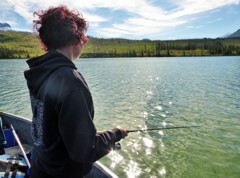 Where are you, pesky whitefish? Taking one second to think, a trip last summer immediately jumps to mind. 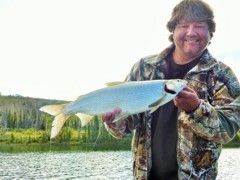 We had been fishing Talbot Lake looking for the elusive, yet very large lake whitefish known to reside there. Toward the end of the day when we were literally headed back to the boat launch we found a school of them. Dozens to hundreds of them, and they were all big. We found the holy grail, and I was bent on returning to Talbot asap. I immediately committed to coming back the next weekend, regardless of everything. I didn’t care that getting to Talbot meant doing a crazy day trip, getting up at a super unhuman early hour, and spending a half of the day on the highway either driving to, or from this mountain playground. I was gonna do it and the moment I said it aloud, I immediately hear "I’m in" from my friend Amanda, and then, "I’m in too", from my friend Wayne. That was the moment. This is what made me smile, and what made both trips amazing! We did go back, and the fishing was just as tough. If it were only easy. We did though, end up catching one of the beasts, but what really makes me happy and the trophy that stands tall in my mind, is how fired up my friends and I were to saddle up, make the journey, and have the adventure.